A new study has found that of all the cars, trucks, crossovers, and SUVs for sale in America, the Mercedes-Benz C-Class has the highest recall rate. A new study has found that of all the cars, trucks, crossovers, and SUVs for sale in America, the Mercedes-Benz C-Class has the highest recall rate. It was found to have a recall rate of 7.3 times the average for all vehicles. The study was conducted by iSeeCars.com. The research team looked at the number of individual vehicle recall campaigns from the National Highway Traffic Safety Administration’s (NHTSA) recall database as of May 1, 2018, for every model vehicle from model years 2013 - 2017. 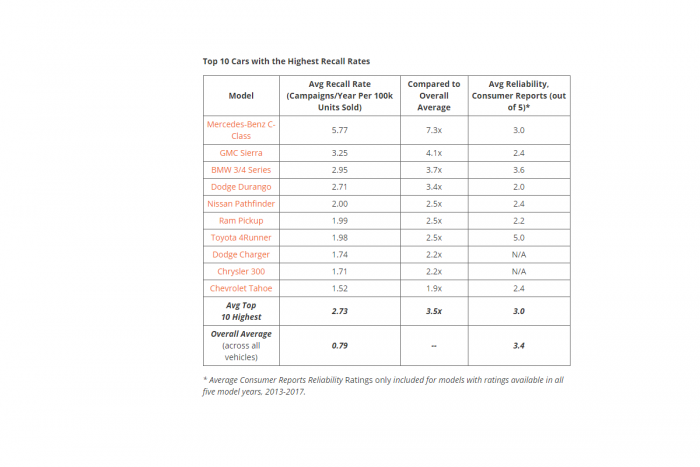 It then calculated an average recall rate (number of recall campaigns/year per 100,000 new car units sold) for each model. It should be noted that other cars may have a greater actual number of recalls, but when the volume of vehicles sold is factored in Mercedes-Benz' C-Class has the highest rate. The C-Class is Mercedes-Benz' highest volume vehicle model, finishing 2017 with over 77,000 units sold and accounting for nearly a quarter of all Mercedes vehicles sold in America. The average rate of recalls measured in Campaigns/Year Per 100k Units Sold, was found by the study to be 0.79. The Mercedes-Benz C-Class had a rate of 5.77. The second vehicle on the list was found to be the GMC Sierra pickup with a rate of 3.25.
iSeeCars reported that recalls for the C-Class over the period studied included multiple campaigns involving failure in the steering column. I was just in an accident where the cruise control of my c-class Mercedes went on without a conscious input on my part and it accelerated the car at the highest rate of speed possible, resulting in a four car accident on the 405 Freeway with injuries. Contact thus far with Mercedes-Benz has yielded little information and likely some falso information. Anyone with knowledge of C Class Mercedez-Benz Cruise Control issues is invited to write in here.